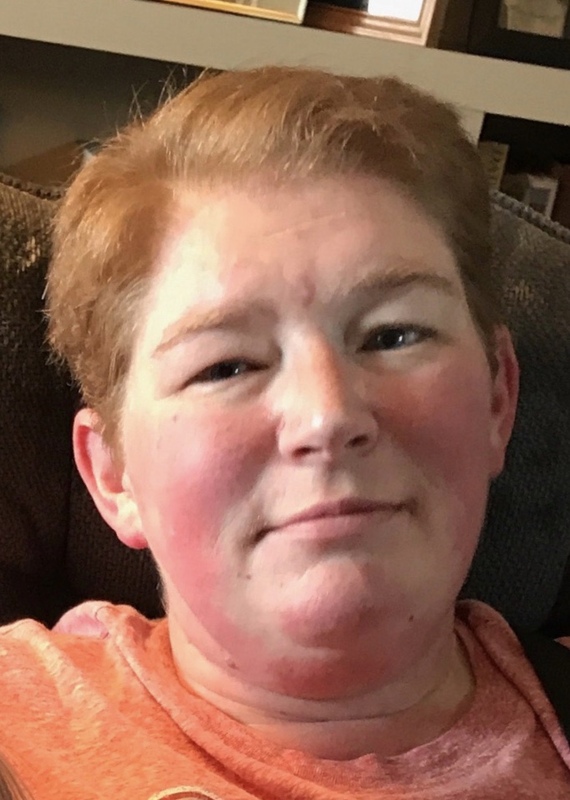 Meg Speyer, 37, of Richwood, died early Thursday morning April 4, 2019 at the O.S.U. Medical Center following a 17-year battle with pulmonary arterial disease, which is high blood pressure of the lungs. She was born June 25, 1981 in Kenton to Joe and Marty (Marlor) Speyer and they survive in Richwood. She is also survived by her sister, Liz (Jim) Ames of Richwood and their children: Lance Grubb, Evan and Ellen Margaret Ames. Meg was a dedicated 17-year employee of Comp Management of Dublin, where she worked until she was unable due to her illness. Meg was a talented quilter; she enjoyed giving her hand made treasures to her family. Meg loved 80’s music, watching Saturday Night Live and was not fond of social media. She loved her family and cherished the time spent with them, especially her niece and nephews. A Gathering of Family and Friends will take place Sunday April 7, 2019 from 2-5 pm at the Stofcheck-Ballinger Funeral Home in Richwood. Private burial will take place at the Price Cemetery. Joe and Marty so sorry to hear about Meg. She was a wonderful girl and you guys got to spend a lot of wonderful memories with her. She is now out of pain and will be watching over you all. Prayers being sent . I am so sorry to hear about Meg. I worked with Meg at CHS and really enjoyed our talks and time together. She will be missed by many, my thoughts and prayers are with your family during this difficult time. So sorry, I remember Meg as such a sweet child with a charming smile and that beautiful auburn hair. May her family be comforted by their God and their friends. I worked closely with Meg for 15 years and my fondest memory was how kind she was to my daughter, Allie, giving her candy bars when she was a two year old. Allie would write Meg notes and Meg would post them in her work area. She was an amazing women. we are so sorry for your loss. Our thoughts and prayers surround your family. Expressing our deepest sympathies for your family from ours. Very saddened to hear of your loss. What a sweet soul. Thoughts and prayers for you. Dear Marti and Joe ... we are so sorry to hear of Meg's passing. Burying a child is one of the hardest things you'll ever have to do. Our thoughts and prayers are with you! Thank you so much for bringing such an amazing light into this world. Meg was such a unique person, you could not help but to gravitate towards her. I worked with Meg for the last 7 years, and she is part of my fondest memories at CHS. I will wear her dinosaur dress with honor. Meg brought sunshine and motivation to those she cared about and she really knew what was important in life that really mattered. We have and will continue to think of and miss you. Im so sorry to hear this. I remember growing up with both the girls. My prayers and thoughts are with you all. Thoughts and prayers during this time are with you. Praying the memories will give you peace and comfort now and in the days to come. We are so sorry for the loss of your Meg. We will keep you in our prayers. Joe and Marty, So sorry to hear about Meg. Her humor matched yours Joe! My thoughts are with all of you. There are no words to describe how much joy Meg brought to all her friends She was awesome at her job and no one could ask for a better friend. We will miss her, but know she is in pain no more. My thoughts and prayers are with the entire family and friends. I worked with Meg at CM on our activities committee, she always had a smile and willing to do anything for anyone. She definitely brightened up and touched a lot of people here at our company. She will be missed dearly but I am glad that she is not suffering anymore. Prayers to the family. Please accept our deepest condolences on the passing of Meg. I worked with Meg at CompManagement. She was bright and funny and I always enjoyed my interactions with her. May she rest in peace. I am sorry to hear of the loss of Meg. I admired her work ethic. She was a spunky funny girl with a good heart. She will be missed. My heart hurts for her family. My heart goes out to you and the rest of the family for the loss of such a beautiful person. I had the honor of working with Meg for 9 years here at CompManagement. Meg and I would kid around with each other almost on a daily basis when our desks were near each other, but even more when she got her motorized scooter; she would often tell me to move or get run over or ask if I needed a lift, because I wasn't walking fast enough...LOL. I will miss her immensely, but I can at least say that I will always remember her smile. So sorry to hear the loss of your Daughter . You have my sympathy. Nothing worse than the loss of you child. But many good memories. Meg was so funny. I loved our talks and she will be missed. We usually talked about cruises. She will now be watching everything from heaven without hurting. Prayers for you family. I was so sorry to hear of Meg’s passing. I have fond memories of birthday parties at her childhood home and sitting in the back seat of the family’s station wagon. Meg was ornery, kind, and smart. I’m sad our paths won’t cross again. Wishing her family peace and comfort at this time and always. Although I didn't work closely with Meg, what I will remember is that always seemed to have a smile on her face and a positive attitude even in light of her health challenges. She will be missed. My heartfelt sympathies to her family on their loss. I am sorry for your loss, I pray you all find much comfort during this time. I worked with Meg for the last 5 years and she was one of the nicest people I've had the pleasure of working with. I enjoyed her company and her willingness to always help me out. So sorry for your loss. I have so many memories of Meg and your family. She and you all will forever be in my heart. My deepest sympathy to the family. I've known Meg for over 10 years. We really enjoyed opening those "grab" bags at work. We would compare what we had and switched items... mostly candy. She was nice to talk to and regardless of how she was feeling, she always had a smile on her face. She was a great person. I hope you are comforted by the fact that Meg was so very special to a multitude of people. Meg will forever be in my heart and I will always remember the time we spent together laughing. She had a great sense of humor and approach to life and loved her family dearly. She is loved and will be missed. I had the pleasure of working with Meg for 14 years at CHS, on the Activities Committee and as Kid Coaches. She was always smiling and loved talking about her niece and nephews and always asked how my daughter was. We had the pleasure of working closely during Open Enrollment and she made the tedious work fun. Her smile was infectious and her shoes were always cool :) We shared a love of Dr. Pepper and she will be greatly missed at work. My sincerest condolences for your family. I am so sorry to hear of Meg's passing. My thoughts and prayers are with you at this difficult time. I had the privilege of working with Meg for over 12 years at CHS. We became great friends right away and always had a lot of laughs together at each other’s expense. Meg had such a big impact on me, our department, and everyone at CompManagement. I think Meg was literally friends with everyone in our entire building – and we will all miss her dearly. My heart goes out to you and please know that you are in my thoughts/prayers. You and your family certainly have our sympathy in your loss of Meg. We are so sorry that she had to suffer with this long-lasting illness, but you were so good to her. God bless you all! Thinking of you and asking God to wrap you in his loving arms and give you comfort and peace. I am so sorry to hear of Meg’s passing. I have many memories of her growing up. Prayers and comfort for your family. So very sorry your loss, Liz! Your family is in my prayers. So sorry to hear of Meg's passing. She was a lovely lady. Hugs and prayers are with you. I was deeply saddened to hear this news and have spent many hours reflecting on the times Meg and I shared laughing, playing jokes around the office, and my favorite memory: listening to old school rap music to which Meg AWESOMELY knew all the words and would put on a full-on show with her skills! Meg was not only a really fun person to be around but she was very thoughtful and caring; she often went out of her way to help others, she enjoyed being a part of something bigger than herself. I had the pleasure of forming a friendship with Meg and her infectious smile and upbeat attitude is what I loved most about her! It was amazing to see her at her best when it seemed life had dealt her hand that was so difficult, but she persevered. The way she lived life to the fullest of her ability was an inspiration to me. Most times we focus on the smallest things and loose sight of what living is all about - I really appreciate Meg for putting this into perspective, leaving a lasting mark on my life, and I feel lucky to have known her. Meg will be missed by many and I hope she is dancing with the angels free of her pain. Joe, Marty, and family: We are so saddened to learn of Meg's passing. Wishing you peaceful and happy memories of all the amazing adventures you had with your sweet daughter. We are so Sorry for your loss!! Our prayers and thoughts are with you and your family. Bill and I offer our condolences on the loss of your daughter, Meg. I have fond memories of her during Middle School and High School when she and Karen were in band. The best memory is of the field trip to Alum Creek and paddling around in the canoe/kayak? with her, Karen, and Mrs. Rubek, laughing all the time. Joe and family, sending deepest sympathy at this difficult time. So sorry for your loss. Joe and Marty we are so sorry for your loss and we are thinking of you at this difficult time. My sincere condolences to all of Meg's family members and all those who knew her. Losing a loved one is never easy and I pray that God graces you all with His comfort and love. My thoughts and prayers are with Meg and her family/friends. My deepest sympathies. My sincerest condolences to Meg's family. While I did not know Meg, I work at Sedgwick and wanted to share my condolences. She seemed like a wonderful person and I am sure she will be truly missed by all. Gone too soon, may she rest in peace. I'm a employee with Sedgwick, I send my love and prayers to the family. At your time of loss. May she live on in everyone's memory. My deepest sympathies to all the family. It's not easy to lose someone you love. May you all receive peace and strength during this difficult time.